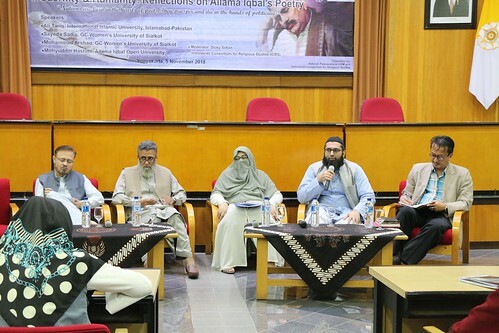 ICRS in collaboration with the UGM Graduate School organized public lecture entitled Modernity & Humanity: Reflections on Allama Iqbal’s Poetry (5/11) and respective speakers in this event are from Pakistan. They are Ali Tariq from International Islamic University, Islamabad – Pakistan, Sayeda Sadia from GC Women’s University of Sialkot, Muhammad Arshad from GC Women’s University of Sialkot, Mohyuddin Hasmi from Alla Iqbal Open University. The discussion process is led by Dr. Dicky Sofjan (ICRS Core Doctoral Faculty) as the moderator. Ali Tariq from International Islamic University, Islamabad – Pakistan as the first speaker told who Allama Iqbal was. In his explanation he explores more about Allama Iqbal’s perspective on Humanity and Modernity. Iqbal’s concept of humanity focus on freedom as the most authentic mode of human existence. According to Iqbal the aspect of action is very important in human existence. It may be called the essence of his life. Sayeda Sadia from GC Women’s University of Sialkot as the second speaker delivered some parts Iqbal’s poetry. The poetry was read in original languages, Urdu and Persian. The third speaker Muhammad Arshad explained the idea of Iqbal’s political movement and concept of Pakistan and the last speaker, Mohyuddin Hasmi from Alla Iqbal open university, also delivered Iqbal’s poetry in Urdu and Persian language. All in all, the summary of the discussion is thatIqbal rejected secularism and traditionalism and considered modernity to be an effective antidote to these extreme, opposing viewpoints. On the other hand, Iqbal’s poetry also gives the massage of humanity to always respect the diversity. In addition, Iqbal’s poetry delivers the message to always live in a peace.